Ah, moonwalking. Michael Jackson’s famous dance step is mesmerizing to watch – especially when the King of Pop does it. It’s the perception that you’re moving forward, when you’re actually going backwards. Missouri’s minimum wage is like this, except it’s not entertaining one bit. The state’s minimum wage is set to increase by a paltry 15 cents on January 1. It will go from $7.50 to $7.65. That’s an annual salary of $15,912.00 before taxes. This is no increase; it’s just keeping low-wage workers from going backwards quicker. Moonwalking! In 2006, Jobs with Justice led the minimum wage fight and made sure an automatic cost of living raise was included. Even still, it’s not a livable wage. Many workers are piecing together two or three low-wage jobs to make ends meet. Between employer wage theft and prices of other commodities going up, you can never get ahead. There were low-wage workers and their supporters testifying for the righteous need to make $15 per hour. There were also small business owners coming to the podium who felt that BB83 would negatively impact their bottom line, maybe even force them to lay off workers or, worse, close their doors. Both workers and small businesses should be able to get what they need. The U.S. is at a place in time when income inequality could only get worse if we worked for free. According to Mother Jones, the top tier of the 1 percenters is averaging $27 million per household in annual income – $27 million. And we’re fighting in Missouri for $15 an hour? 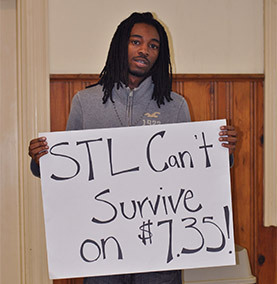 It was disappointing to see the Board of Aldermen not take a serious stand on BB83 that would raise the minimum wage to $15 by 2020. There are constituents in every ward who would benefit from such an increase. I challenge the people who I hear asking why should fast food workers get $15 an hour when they are a secretary or maintenance worker and don’t make that. You should be. Fight for it. We are focusing on the wrong salary. Don’t think about the yearly salary of $31,000 a worker would make at $15 an hour. Think about the $27 million per year of a 1 percenter. We need to get serious about a living wage in Missouri, and there are many solid reasons why our families are so deserving. We won’t get it if we stay fixated on why workers shouldn’t get $15 an hour. We won’t get it if we think it’s okay for employers to pay poverty wages so that taxpayers have to pick up the tab on food stamps, Medicaid and other government benefits for these companies’ employees. Many of us worked with Jobs with Justice to collect thousands of signatures to put the initiative on the ballot. Yet, here we go again, 10 years later. Let’s stop moonwalking over the working class. Let’s go for that $27 million of the ruling class.